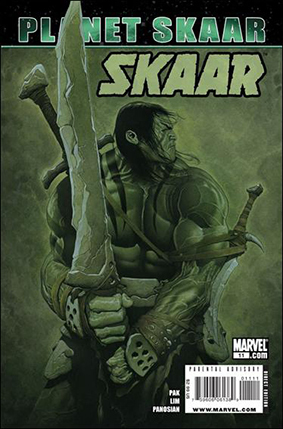 • PLOT SUMMARY: PLANET SKAAR: Pt. 1 - Written by GREG PAK. Pencils by DAN PANOSIAN & RON LIM, inks by PANOSIAN & GREG ADAMS. Too savage for the savage planet of Sakaar, the Son of Hulk has been exiled to the puny little mudball known as EARTH! Can a confrontation with his father be far behind? Also -- the return of the Warbound! These monstrous alien heroes stood by the Green Goliath throughout the epic tales of 'Planet Hulk' and 'World War Hulk.' Now can they save the soul of the Hulk's barbarian boy? 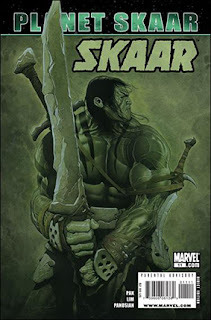 Skaar, Son of Hulk, begins his epic clash with the Marvel Universe!